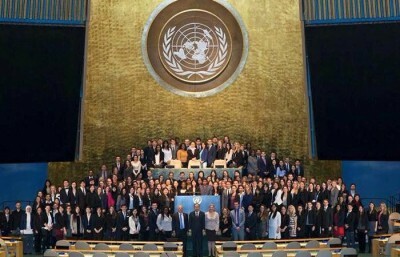 Less than a month after arriving in New York to begin an internship at the United Nations, FIU alumna Valeriana Chikoti-Bandua received an opportunity to do what only a few other interns have. Not only did she get to meet U.N. Secretary General Ban Ki-moon, she was also invited by him to deliver a speech on behalf of her fellow interns on the floor of the General Assembly. Being the only Angolan interning and currently working in the U.N. Secretariat, which carries out the diverse day-to-day work of the U.N. with an international staff working in duty stations around the world, Chikoti-Bandua stood out to the secretary general. 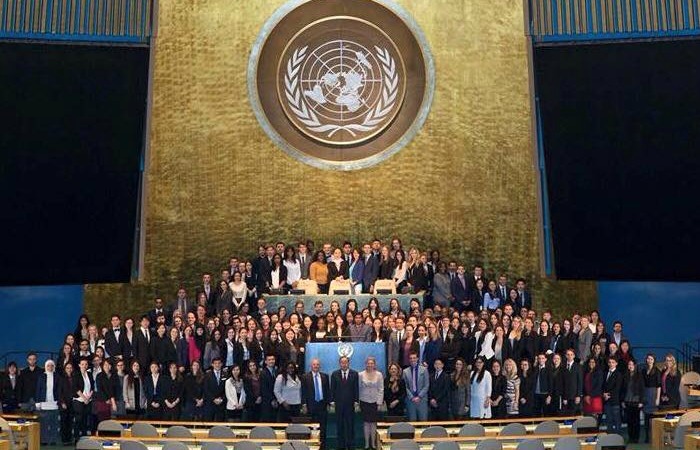 In her two-minute speech on Feb. 17, Chikoti-Bandua thanked the secretary general for the opportunity to work, learn and serve in the United Nations and urged fellow interns to take up the responsibility to address various issues facing the world. “As future leaders, it is now our duty to stand in solidarity to speak up in order to address global issues that pertain to the reduction of poverty and gender inequality while also working to create tangible solutions that address economic and social injustices and disparities,” she said in her speech. For Chikoti-Bandua, who graduated from FIU’s Master of Arts in Global Governance program (MAGG) and was born a refugee, many of the issues she touched upon in her speech hit close to home. Valeriana Chikoti-Bandua graduated from FIU’s Master of Arts in Global Governance (MAGG) program in 2014. Chikoti-Bandua was born in Zambia after her parents were forced to flee from their home country of Angola as young children with tens of thousands of other Angolans to seek refuge from war. When she was three years old, they moved again, to Papua New Guinea, where she spent most of her childhood growing up. Growing up as an African in a different nation, she initially struggled in elementary school and middle school to fit in, because many times she was looked upon as an outsider and experienced bullying, racism and other harsh realities. Looking back now, however, Chikoti-Bandua sees her differences as a blessing rather than a curse. Throughout her elementary, middle and high school education Chikoti-Bandua went to different international schools and some of her teachers helped her grow into leadership roles as one of her school’s student body presidents. After her father’s passing in 2004 and then graduating as the salutatorian at Port Moresby Business College, Chikoti-Bandua was at a crossroads when the opportunity to come to the United States to pursue a college degree presented itself. After a lot of consideration, she decided to take the leap. 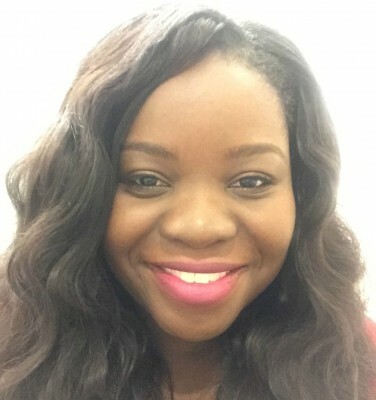 After getting her bachelor’s degree at Oral Roberts University in Tulsa, Okla., she learned about FIU’s MAGG program through a Google search and applied. She graduated from the master’s program in Spring 2014 and hopes that her education and internship at the U.N. lay the foundation for a life dedicated to serving those who are going through what she faced growing up. Driven by her faith, family and closest friends, Chikoti-Bandua says she is dedicated to being an advocate for human rights in Sub-Saharan Africa and around the world in some capacity, whether it be at the U.N., a position of leadership in Angola or through another international organization. Wonderful news about an amazing student. Anyone who knows Valeriana can attest to her commitment to advocacy and empowerment for those who need it most. She will surely do great things in this world. With as much money and power as the UN has, there should be NO poverty in the world. So it makes you wonder. Is the UN evil? Incredible story! Valeriana has set the bar higher for the future FIU students. Editors: Port moresby posted a negative remark about white kids. Yet you printed it. You won’t print any negative remarks about any other race. Why is this? Port, white people are not exclusively racist. And your remark is racist in itself. Congratulations Val! So proud of you! You are definitely a role model for many young people to follow. Continue to break ground! But violence against women and children is. My comment was about racism in PNG not about violence against women and children. I am also aware that this is also a big issue. I understand. But I don’t think this young woman’s words should be discredited.